The Jackfruit is an enormous Fruit which is large and bushy found growing mainly in tropical areas ( Karnataka and Kerala in India) which are seen to have Monsoon rains. 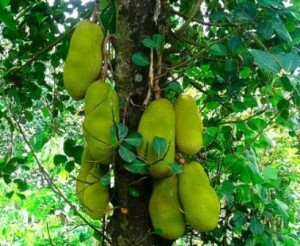 The young branches of the jackfruit contain humid white latex which can be useful to make birdlime easy. The tree leaves are oval shaped and deep in green colour,, sleek and grow in clusters. Its unique male and female flowers bear in separate flower heads and are mostly seen in February and March months in a year. The difference between the female and male flowers – female flowers appear on short twigs from the trunk. Male Flowers has pollen and the female flower doesn’t have it and another characteristic feature of the female flower is that it begins to enlarge very soon. Fruits are frequently sliced and sold raw in parts of southeast Asia. The seeds can be boiled or roasted and are said to taste like chestnuts. 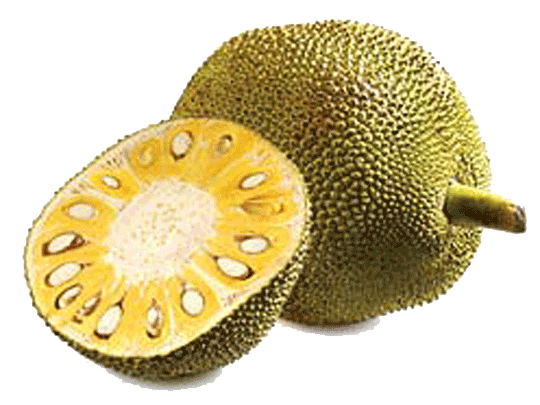 Jackfruit is, commonly available in most Asian markets. It is very straightforward with a good, not quite crispy surface, and the gentle taste of pineapple and a slightly characteristic musky in taste. Huge and thorny on the outside, jackfruit looks more or like durian. Once a jackfruit is cracked open, what you will find inside are pods or “bulb”. Regularly referred to as seeds, these bulbs are actually, kinds of fleshy covering over the true seeds or pits, which are round and dark like chesnuts. The fleshy part can be eaten, or cut up and cooked. When immature, it is amazingly similar in grain to chicken, making jackfruit is an excellent vegetarian substitute for meat. In fact, canned jackfruit is sometimes referred to as “vegetable meat”. 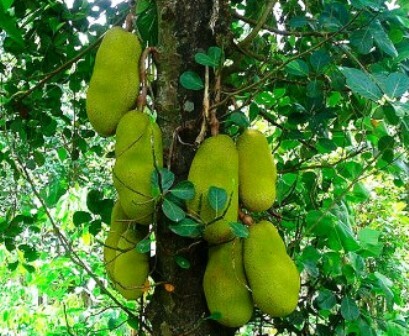 There are a lot of benefits of the Jackfruit tree. It is a very nutritional and tasty fruit and even the seed of the fruit is edible and very high in nutritional value. The tree will yield a strong wood when mature and valued for its hard-wearing termite proof timber which can be used to build furniture. The leaves are one of the favorite diets of goats in these tropical areas. Jackfruit is very functional when it comes to lowering blood pressure due to its very high level in potassium. 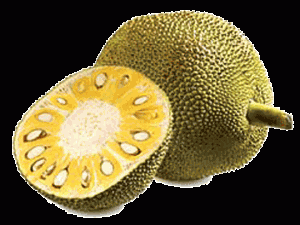 The root of the Jackfruit is known to have many remedial benefits. Its extracts are used by medicine to cure fever and diarrhea, it is also found to be valuable for asthma patients, and used to treat many skin problems as well. In Addition, the Fruit contains a high quantity of Vitamins such as Vitamin A, Vitamin C, Calcium, Iron, Sodium, and many added feature of nutrients.. The Vitamin C nutrition helps to increase the body’s immune system and keep gums healthy.. The sweetest and best is considered as the Honey Jack. The seeds have around 135 kcal/ 100 gms. It is a rich source of complex carbohydrate, dietary fiber, vitamins like vitamin A, C and certain B vitamins, and minerals like calcium, zinc, and phosphorous with high nutrition benefit in a seed. 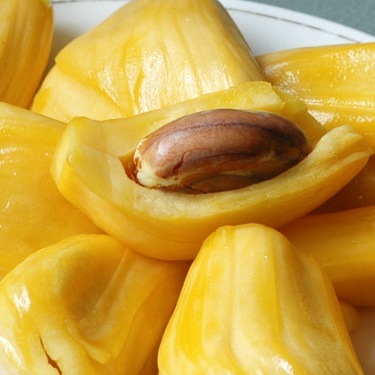 Jackfruit seed contain lignans, isoflavones, saponins, that are called phytonutrients and their health benefits are wide-ranging from anti-cancer to antihypertensive, anti-ageing, antioxidant, anti-ulcer, etc.